The Hollow Hills Merlin the Enchanter, prophet and visionary, adviser to kings: Here is the story of how he rears Arthur, the future Christmas King, in remote secrecy, safe from the warring kings and Saxons who plot against his father, King Uther. Told in the voice of Merlin himself, this tale bristles with all the suspense and intrigue of fifth-century Britain. Ambrosius is dead, having brought order and progress to the kingdom during his reign. Now the regional kings look to the succession, and Merlin watches and waits, always providing for the security of the boy his prophesies promise will become the greatest king of all. Mary Stewart's incomparable storytelling gifts bring the legends to luminous life in this, the second volume of her widely acclaimed Merlin Trilogy. This dramatic reading by Nicol Williamson offers the experience of hearing the story as it might have been told by Merlin himself. 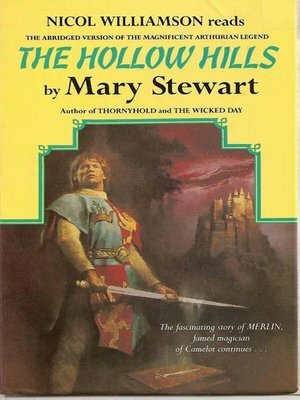 Mary Florence Elinor Stewart is best known for her series about Merlin which straddles the boundary between historical novel and the fantasy genre. She is also the author of many crime fiction, gothic fiction and romance novels.